RiGBY the Barbarian is my husband's new webcomic featuring a witty heroine as she navigates a world of reanimated skeletons, warriors on dinosaurs and savage snake-men. The artist, Lee Leslie, has described the webcomic as combining "the fun world-building of high fantasy stories like Lord of the Rings or Conan the Barbarian with a fun and relatable protagonist. Basically, she’s the love child of Indiana Jones and Red Sonja.” I like to think of it as a fun mashing of Masters of the Universe and Braveheart. Either way, you can't go wrong. It's a fun read! RiGBY may have already ventured into the world of high fantasy, but now the heroine and her webcomic are venturing into the world of print comics. Pre-orders are currently open and will run until February 11. This is RiGBY’s first official print appearance, and the 20 page, full color comic will only be available at conventions and signings after the pre-sale. If you pre-order the comic you will also be treated to a high resolution digital version. Lee finding inspiration for RiGBY in the hills of Western South Dakota. 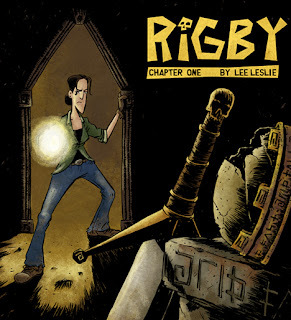 RiGBY, created by writer and artist Lee Leslie, first appeared online in May of last year, and is currently nearing completion of it’s third chapter. New installments are posted weekly. Further press inquires can be directed at creator Lee Leslie via email at rigbythebarbarian@gmail.com. Meet Mrs. Incredible (Elastigirl) and Dash!